Mike Epps has generated an extraordinary amount of buzz among his peers within the entertainment industry for being one of the funniest comic actors to emerge in the Hollywood scene. Epps has appeared in a number of films including, Welcome Home Roscoe Jenkins, The Grand, Soul Men, Hancock, Janky Promoters, Next Day Air, Resident Evil: Extinction, All About the Benjamins, Next Friday, Friday After Next, The Honeymooners, Guess Who, How High, and Dr. Dolitle 2. 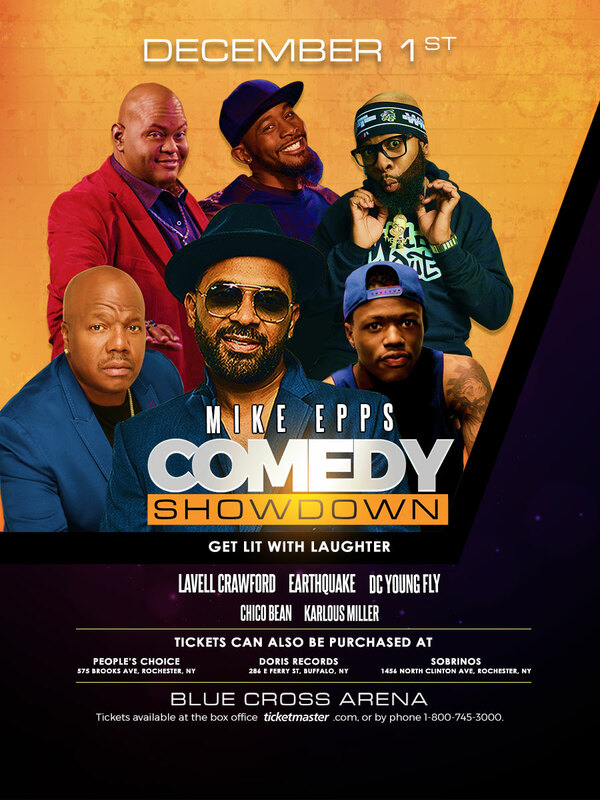 Epps has also performed at countless comedy shows and festivals including The Mike Epps On the Edge Tour, and HBO special, Inappropriate Behavior, hosting duties of HBO’s Def Comedy Jam, Laffapalooza Festival, Def Comedy Jam Tour, and more. About EarthquakeEarthquake is an explosive comedic performer unlike any other. His stand-up comedy is at its peak, his ability to engage an audience is nationally known and he is now being heralded by critics as one of the most talented comedians in the country. Comedian, Lavell Crawford is quickly climbing the comedic ranks and becoming one of the hottest stars in the biz today. He filmed a new one-hour special in his home town of St. Louis, “Can A Brother Get Some Love?,” and is on DVD from Entertainment One. In addition, he filmed an episode of “Workaholics” for Comedy Central and he’s been casted in a recurring role on the AMC’s Emmy Award-winning “Breaking Bad.” If that’s not enough, he was also seen as a regular panelist on E! Entertainment’s “Chelsea Lately” and a regular on “Lopez Tonight,” performing in various comedy sketches on the show. From his numerous television appearances and as one of the hottest touring acts in the country, audiences are becoming increasingly familiar with Lavell’s giant-sized talent. Lavell gained huge national exposure on NBC’s hit reality series “Last Comic Standing.” Not only did NBC take notice, promptly signing Lavell to a holding deal with the network, but also Comedy Central, offering him his own half-hour standup special, “Comedy Central Presents: Lavell Crawford.” Lavell’s stand-out work includes appearances on “Shaquille O’Neal Presents: All Star Comedy Jam” which premiered on Showtime in December, “Russell Simmons’ Def Comedy Jam” on HBO, “Showtime at the Apollo,” “Martin Lawrence Presents 1st Amendment,” “Comic’s Unleashed with Byron Allen,” “Steve Harvey’s Big Time” “Comedy Central’s Premium Blend,” “Motown Live” and “BET’s Comic View.” In addition, Lavell has appeared in the films “Baby’s Mama Drama,” “Beverlyhood,” “Ghetto South Problems,” and on the televised series “The Jamie Foxx Show.” On stage, he played Ben in the hit play “Men Cry in the Dark,” based on the Michael Baisden best seller. Lavell also recently appeared on stage with the critically acclaimed production “Friends and Lovers,” a stage production based on the novel by author Eric Jerome Dickey where he played the scene-stealing Bobby. The play also featured notable actors such as Miguel Nunez (“Juwana Man”), Leon (“The Five Heartbeats”), Monica Calhoun (“The Best Man”), Mel Jackson (“Soul Food”) and Maia Campbell (“In the House”). Endeared by audiences far and wide, Lavell has built a very strong fan base playing theatres, comedy clubs and colleges across the nation in addition to festivals including HBO’s US Comedy Arts Festival, The Comedy Festival and LAFFAPALOOZA, America’s longest-running annual urban comedy festival. DC Young Fly’s expansive work in the comedy, acting, and digital spheres have made him a standout as an entertainment multi-hyphenate. A comedian, actor, social media influencer, musician and podcast host, DC has proven that innate comedic ability, abundant creativity, and a passion for generating laughter in others can be translated across multiple mediums. Originally having picked up traction for his hilarious videos on Vine, DC is a hands down fan-favorite amongst today’s generation, currently holding an overall deal with MTV/VH1. He is a veteran cast member of Nick Cannon’s WILD ’N OUT, which is entering production for its 13th season, and has brought the humor to MTV’s TRL (Total Request Live reboot) as one of its main hosts. On the acting front, his credits include BET’s THE NEW EDITION STORY and Will Packer’s ALMOST CHRISTMAS, in which he plays ‘Eric’ alongside Mo’Nique, J.B. Smoove, and Gabrielle Union. DC also recently played ‘Jaymo’ in Jerrod Carmichael’s new multicam comedy series for FOX, REL. He can next be seen in the Lionsgate Feature Film, TWO MINUTES OF FAME, Nick Cannon’s SHE BALL, and Master P’s upcoming Independent Feature, I GOT THE HOOK UP 2. DC has also made several unscripted guest appearances on projects including BET’s gameshow, BLACK CARD REVOKED, and VH1’s HIP HOP SQUARES, where his natural comedic timing and energy played well with sold out live audiences. As a creator, DC’s original online comedy videos have garnered him a huge following, including over 6.8 million Instagram followers; 1.2 million Facebook fans; 220k Twitter followers, and 20 million views on YouTube. Always a fan of live performances, he tours the country both as a headliner for sold out shows in the stand-up space and as a host of the hilarious 85 SOUTH SHOW podcast. 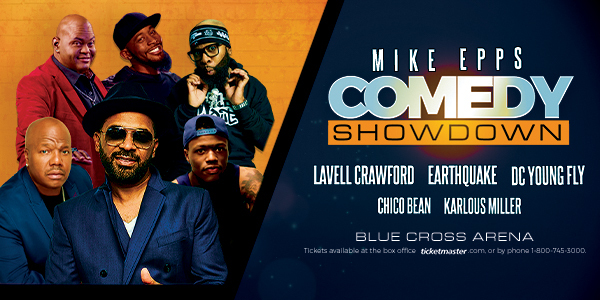 Karlous Miller is a comedian/actor most known for being a veteran cast member on MTV’s Wild ’N Out with Nick Cannon. NBC’s LAST COMIC STANDING alum, Karlous can also seen on MTV’s JOKING OFF, MTV2’s UNCOMMON SENSE, BET’s COMIC VIEW, and Bill Bellamy’s WHO’S GOT JOKES. Every week, Karlous hosts the hit 85 SOUTH SHOW podcast with DC Young Fly, which has gained a fanbase across the globe. He most recently filmed for HBO’s stand-up series ALL DEF COMEDY (reboot of Russell Simmons’ Def Comedy Jam) as well as his 30-minute special on Kevin Hart’s Laugh Out Loud network. Karlous has also guest starred in the sitcom FAMILY TIME for BounceTV. Although Anthony “Chico” Bean has only been doing stand-up for 6 years, has compiled the experience of a well-seasoned comedian. Through his budding success as an opener for Chris Wiles, Chico became a founding member of the NC Comics All-Stars as well as NC’s Freestyle Funny Comedy Show. He has performed all over the country at Comedy Clubs, Colleges and Universities. Recently he just completed a run in New York City which included taking the stage at the renowned Gotham Comedy Club for the Nick Cannon CBS Fresh faces Comedy show. Chico also recently worked as a writer & actor on the upcoming E! network sketch comedy series The James Davis Project.